These are my first reloads for the 308 using IMR-4064. These rounds were build with a new Whidden FL bushing sizer die and a RCBS .336 neck bushing. 3 rounds each starting 41.5, 41.75, 42.0 42.3, 42.6, 42.9, 43.2, 43.5. OAL 2.860, these reloads cycled through the 5 round AICS mag, with room to spare. Last edited by mike.h; 10-05-2013 at 03:36 PM. What development is left? OK, maybe try a load .2gr on either side but it sure looks like it's the one. BTW, what were the groups on the bottom two targets from? The one on the left sure has no "Vertical" and horizontal spread may be from "behind the stock"
Oops, I didn't list them, 43.2g, 43.5g. All these shots were done round robin (for lack of a better term). Why they are below the cross in the red dot has me confused because they are a hotter charge. Why they are not higher on the target then the 42.6g load? Perhaps the next step is to take the loads of 42.6 and 43.2 out to 200 or 300 yards to see what happens. I don't have a chrony, and the range that I'm shooting at is limited to 300 yards. Where you shooting Mike? It's looking like I will be moving up to your area next summer. Im afraid that if I move back up to Nor Cal, I will miss out on my 1000+ yard ranges. This happens all the time with my rifle. 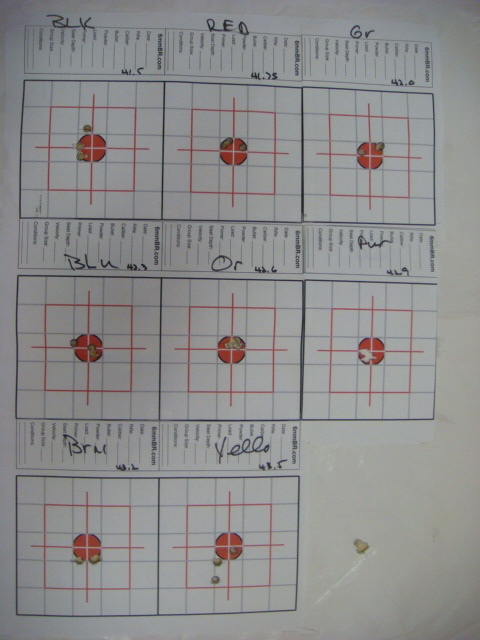 As your loads increase from start impact points can raise or lower, depending on what position the muzzle is in when the bullet leaves. Remember, the barrel is doing all kinds of contorting while the shock wave is moving down it. What intrigued me about one of the lower groups is how it lined up almost in a perfect horizontal line. That usually indicates that the load is dead on as horizontal spread is most often caused by trigger technique, stock position on shoulder, "cheeking" while sending the shot, etc. Again, wiith my rifle I find that a load that lines up the holes like "birds on a wire" usually does best at distance, that is once I get properly lined up behind the rifle and send the shot without moving it sideways. Thanks, good stuff. I'm headed out of town this week, but when I get back, I'll load up some more rounds and head back out to the range.